In early August 1991, a British scientist named Tim Berners-Lee at the European Organization for Nuclear Research (CERN), flipped on the switch to the world’s first website. More than a quarter-century after that very first webpage came online, we have done the hard work of figuring out how websites are supposed to function, and more importantly, how users expect websites to behave. This article will show you exactly what content and information architecture should exist in a typical informational or marketing website. I believe this can apply to nearly any startup or small- or medium-sized business. Most businesses write about themselves from an egocentric point-of-view. The copy often communicates outward. But the problem is first-time visitors to websites often know nothing about the companies and have no affiliation to the brand. It’s like meeting someone for the first time and all they do is talk about themselves. That’s a turnoff, isn’t it? Instead, think about what questions your potential customers might ask, and how you can answer those questions. Write your copy and structure your website content so those new acquaintances can fall in love with you. Before we get into questions, let’s step back for a second. As mentioned in the beginning of this article, over the past 27 years, users of the web have come to expect a website to have certain things. Don’t turn them off or away by not meeting those expectations. Yup, it’s that simple. But as they say, the devil is in the details. Every informational or marketing website will have these 4 pages: Homepage, Product or Service, About Us, and Contact Us. When you’re on a coffee date or at a party and you meet someone new, invariably one of you will ask the other “What do you do?” This open-ended question is meant to be an ice-breaker, an easy intro into the other person. When writing your homepage you need to answer “What do you do?” in a concise manner. What would you say to someone at a party? Yes, use that one-sentence answer. Then you can go into a little more detail if you like. 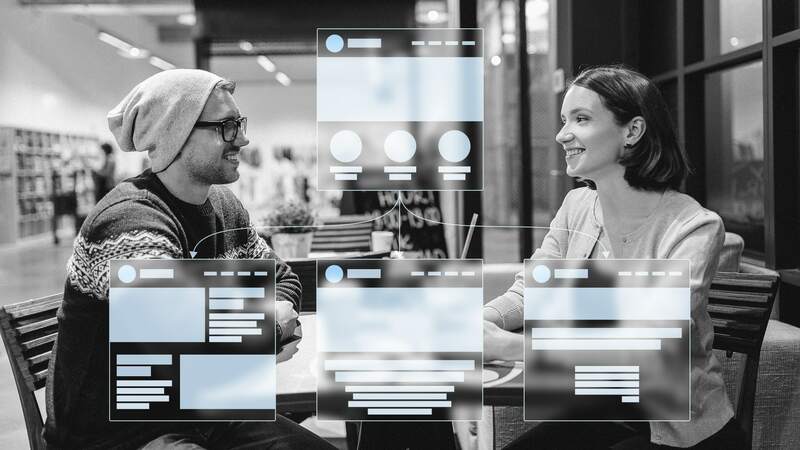 Keep in mind that a more compelling way of describing what you do is to say, “You have problem X, so we made solution Y.” Be empathetic in your content to start building that kinship with your new website visitor. 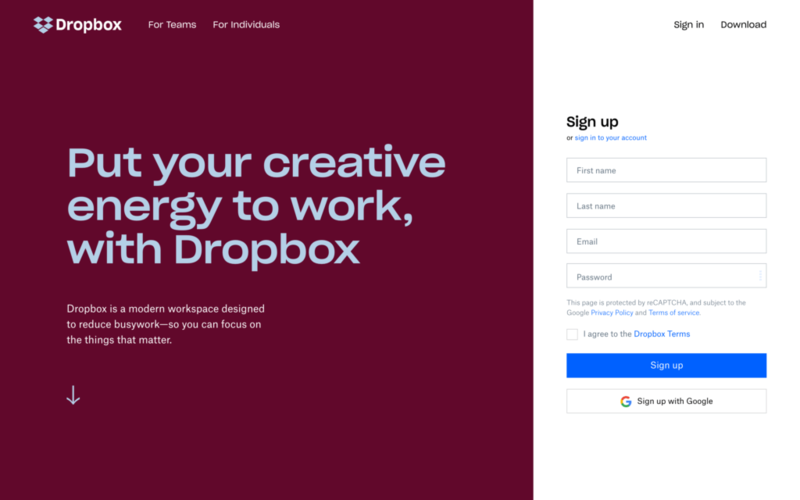 Dropbox’s homepage starts with a headline that is a benefit to the user. Then in much smaller copy, they describe what they do. Now that your new acquaintance is sticking around because they’re intrigued, be a little more specific. They want to know what do you sell that solves their problem. This is where the product or service page comes in. Be as detailed as necessary to keep the user interested. In your content, describe what it is, how it works, and why they should use it. Structure your copy in such a way that answers the basic questions a potential new customer might have. They want to know how your product or service will benefit them, how exactly it’ll solve their problems. 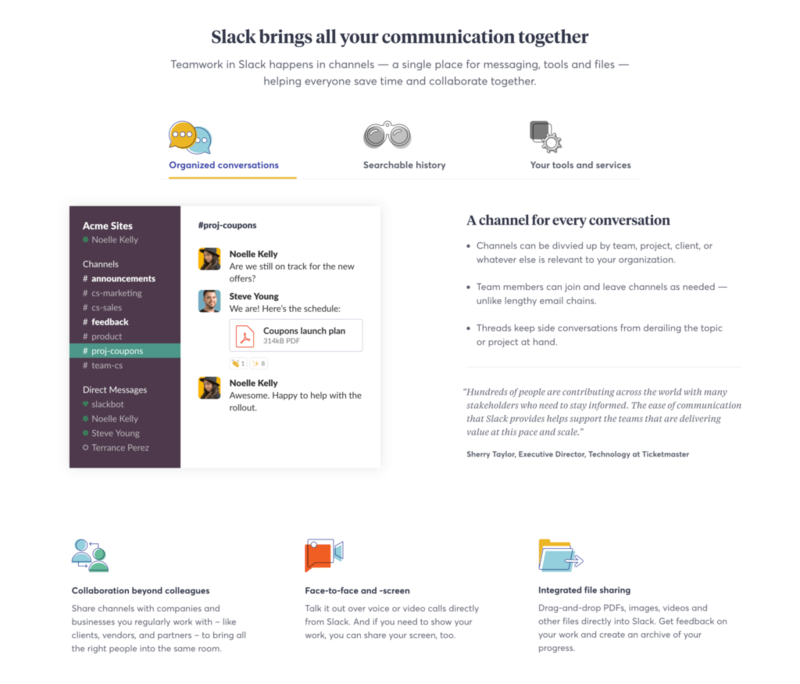 Slack’s product page is titled “Why Slack?” and does a great job of explaining what Slack does and how it helps facilitate better teamwork. Many companies treat their About Us pages as simple biographical content. However it’s an opportunity to tell your story and show off why a visitor would want to become a paying customer. People tend to trust credentials, awards, and most of all testimonials. Use your About Us page to share your company’s and leaders’ highlights as well as your core mission and values. They might be sold on your product, but now give them reasons to be sold on you. Oftentimes potential employees will check out your About Us page to see if you’re a company they want to work for. But if you write and structure this page correctly, you should be able to talk to your customers and employees using the same voice, because your core mission should appeal to both. 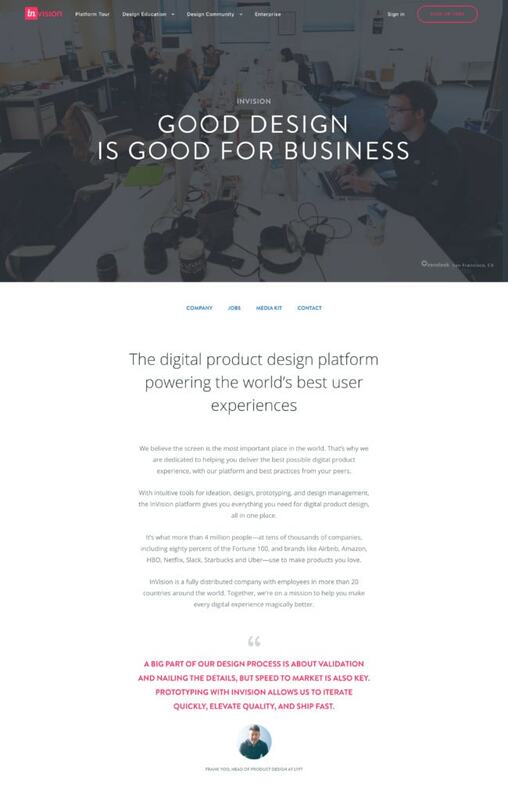 InVision’s company page does a great job laying out their credentials and mission. You should of course have a call-to-action on every one of your pages. But for many website visitors, “contacting the company” is easier to do than clicking the “buy now” button. It’s less of a commitment. Regardless, make it easy for your users to connect with you. Include your physical address, phone numbers, social media handles, and a contact form. A contact form is a really easy way to segment your inbound inquiries to the right people. 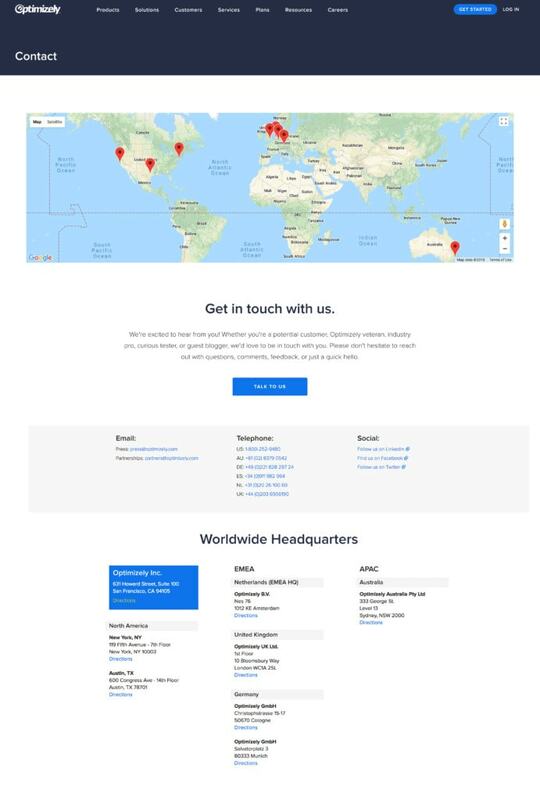 While Optimizely does not have a contact form here, they do list everything else, including a nice map for their different locations. However, you should think about what other information your customers may need and how you should append this basic structure with more content. Will you need a Solutions section where you talk about your products in the context of verticals? Will you want to showcase case studies? Also, there is a current trend for single-page websites. That’s fine but that one long page still needs to contain all the same content as the four separate pages I’ve outlined. As long as you keep your potential new customers in mind as the primary user for your marketing website, they will find it useful. 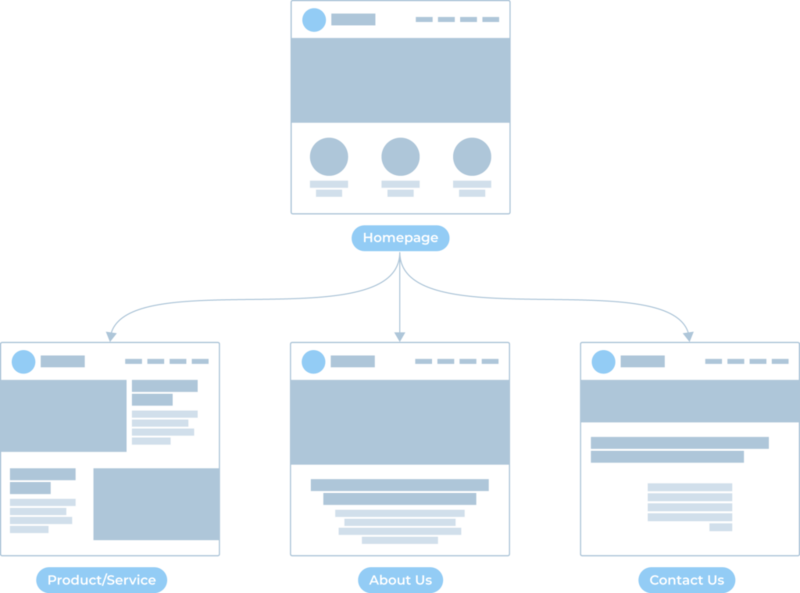 Write your content and structure your website’s information architecture from a point of empathy. As with meeting a new friend for the first time, put them at ease, take the time to understand their needs, and then show how you can help them.